Invited talks by B.S. Manjunath, Jiri Matas, and Bernardino Romera-Paredes. The goal of this third workshop, following on from the successful CVPPP at ECCV 2014 and CVPPP at BMVC 2015 is to continue to showcase the challenges raised by and extend the state of the art in computer vision for plant phenotyping. Plant phenotyping is the identification of effects on plant structure and function (the phenotype) resulting from genotypic differences (i.e., differences in the genetic code) and the environmental conditions a plant has been exposed to. Knowledge of plant phenotypes is a key ingredient of the knowledge-based bioeconomy, which not only literally helps to feed the world, but is also essential for feed, fibre and fuel production. While collection of phenotypic traits was previously manual, non-invasive, image-based methods are now increasingly utilized in plant phenotyping and the resulting images need to be analysed in a high throughput, robust, accurate, and reliable manner. The problems raised differ from the usual tasks addressed by the computer vision community, due to the requirements posed by this challenging application scenario. Plants are complex, self-changing systems whose complexity increases over time. Typical phenotyping problems include measuring the size, shape, 3D surface structure, architecture, and other structural traits of plants and their organs (leaves, fruit, roots etc.). Many scenarios require quantitative description of plant populations, where core problems include reliable detection and multi-label segmentation of many similar objects, or the reconstruction of specular, almost featureless, and overlapping surfaces. Quantitative description of the growth of these complex, deforming objects is vital, and requires suitable tracking, optical flow and/or scene flow estimation methods. Inherently, the tracked objects change their appearance over time. In some cases images may be acquired under controlled conditions, but they are increasingly likely to be taken in more challenging natural environments like greenhouses, or in the field. Automated image acquisition protocols are highly desirable, generating large numbers of images. 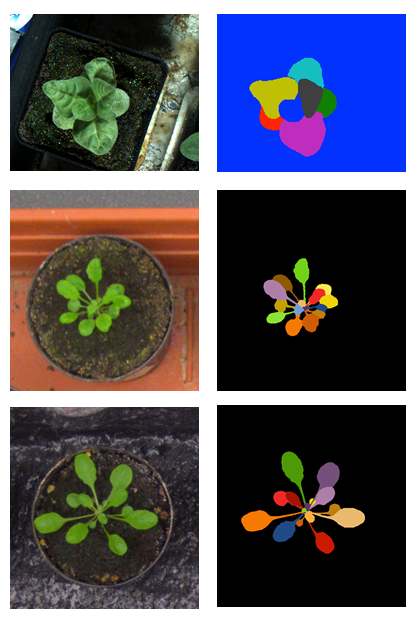 Unfortunately, without automated and accurate computer vision to extract the phenotypes, a bottleneck is formed, hampering our understanding of plant biology. plant phenotyping scientists with rich expertise in image processing and computer vision interested in standardization, as exact problem formulations in fact allow defining standards.